This book is a revised edition of the original compilation of the L. & J.G. Stickley Company�s work during the American Arts and Crafts period. Sixteen pages of additional Onondaga Shops drawings and some photos of pieces in private collections have been added. The book brings together a virtually complete record of this company�s work from 1902 to 1920. The L. & J.G. Stickley Company produced �mission� furniture of a consistently high quality. While many of Leopold Stickley�s designs are similar to Gustav Stickley�s designs, there are variations that show much originality, especially the later prairie-style pieces. This book is the perfect companion to Collected Works of Gustav Stickley and The Early Works of Gustav Stickley. Softcover 208 pp, see below to order. 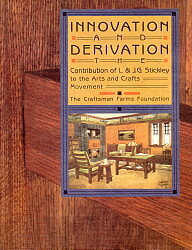 2) Innovation and Derivation - The Contribution of L&JG Stickley to the Arts & Crafts Movement by Donald A Davidoff and Stephen Gray. This heavily illustrated book served as the exhibition catalog for an exhibition of the same name at Craftsman Farms in 1995 and 1996. The book has clear, sharp photographs of every object in the exhibition - many objects rarely seen in museum collections. The noted authors also present a detailed history of the L. & J.G. Stickley Company and the contributions of its principals to Arts and Crafts furniture design, including their relationships with brother Gustav and with other furniture makers of the period. The scholarly research and photographs presented in this work are for the most part not available in any other book. A must for the serious student of Stickley. Softcover 128 pp. Published by Craftsman Farms Foundation (1995), out of print - limited quantity available. See below to order.